On June 9, I took part in a virtual wine tasting. The wines I tasted were an array of reds and whites from Umbria, a small vineyard region in Italy. Wait, what is a "virtual wine tasting," you ask? Well, the tasting was real. The virtual aspect was that a handful of wine writers around the world—including yours truly—were connected via Twitter during the tasting, to exchange and compare notes, provide feedback and so forth. The timing was good, insofar as I'd recently become especially interested in Umbrian wines, thanks mostly to having enjoyed those of producers such as Antonelli, Arnaldo-Caprai and others. The small region of Umbria is bucolic in comparison to its bigger brother, Tuscany. The reds from Umbria I tasted were mostly Montefalco Rosso: light, approachable, everyday wines that are blends of Sangiovese and Sagrantino, plus frequently a splash of Merlot, Montelpulciano or Cabernet Sauvignon. And, while Umbria's best known white wine is Orvieto, I had fun during the tasting mostly with Grechetto and Montefalco Bianco whites. Not all of them might be available where you live, but they are mostly bargains, and worth tracking down or special ordering. Grechetto is a white grape variety of Greek origins that's strongly associated with Umbria, although it's also grown in Tuscany and Lazio. While Grechetto is primarily a blending grape, I tasted a couple wines made solely from Grechetto. 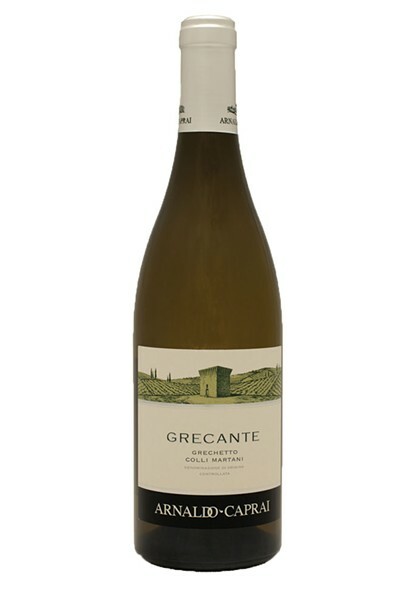 Arnaldo-Caprai Grecante Grechetto 2015 ($19) has the peach aromas you expect in Orvieto, along with green apple and pear flavors. There's a slightly vegetal note mid-palate that makes me think it would be a good partner for salads and asparagus dishes. Terre de la Custodia Grechetto 2014 ($20) is another 100 percent Grechetto wine. As with Arnaldo-Caprai, it undergoes no malolactic, is fermented in steel tanks and sees no oak. Fresh peach scents and citrus flavors characterize this light-bodied, creamy textured vino—one that would pair well with poultry and seafood dishes. Next up from Umbria was a full-bodied white called Perticaia Trebbiano Spoletino 2015 ($23). Although Trebbiano is one of the planet's most widely planted grapes, it tends to produce unremarkable wines. This one is an exception. It's big and bold, with floral and tropical fruit aromas and some nuttiness on the nose. The finish is off-dry (slightly sweet), and I would recommend it to anyone trying to break the Chardonnay habit. Chardonnay lovers will also dig Tabarrini Adarmando Bianco 2013 ($35), a high-end Trebbiano Spoletino wine that is aged a minimum of 12 months in stainless steel on the lees. Frankly, I thought it was aged in wood, given its richness and depth. It's very floral, almost like a cross between Viognier and Sauvignon Blanc, but with the heft of Chardonnay. I'd love to take it for a spin with a creamy lobster or crab dish. Scacciadiavoli literally means "cast out the devils" in Italian, and the Scacciadiavoli winery takes its name from a 19th-century exorcist who lived in the small village bordering the winery's vineyard. Scacciadiavoli Montefalco Bianco DOC 2014 ($20) is a full-bodied, complex blend of Grechetto (50 percent), Trebbiano (25 percent) and Chardonnay (25 percent). Prior to blending, the Grechetto and Trebbiano are aged in steel tanks sur lie, while the Chardonnay ferments in wood casks. The result is a fruity nose of apricot and peach with floral hints, and a crisp mouthfeel with a long finish. Of all the wines I was able to taste—too many to list here—my favorite was Còlpetrone Montefalco Rosso 2011 ($16). Made from Sangiovese, Sagrantino and Merlot, this is a powerful, but well-balanced, red that is perfect for roasts and grilled meats. Next time you're wine shopping—cyber or otherwise—take a trip to Umbria.